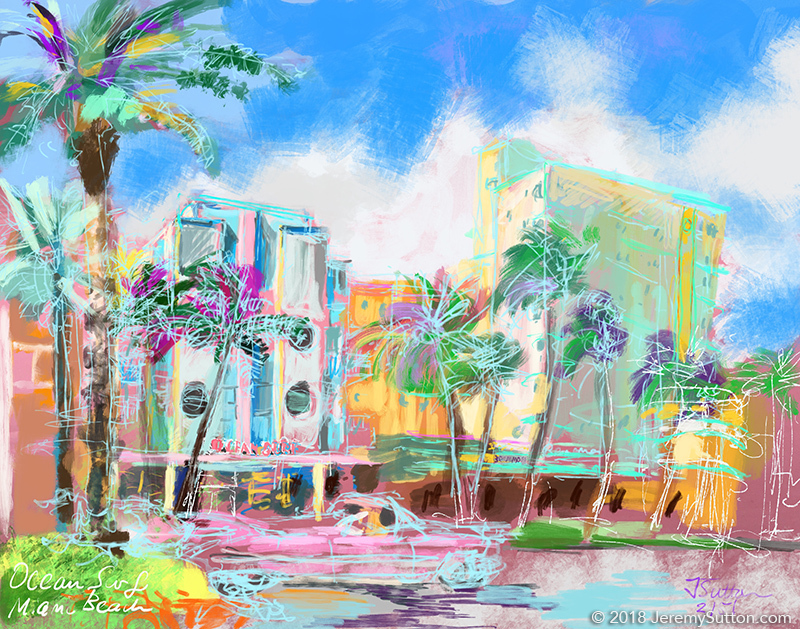 During a week segment in the middle of my Art of Jazz tour painting with the Birdland All-Stars featuring Tommy Igoe, I stayed in Miami Beach at the historic 1940 Art Deco Ocean Surf Hotel. One morning I came out of the hotel to find a beautiful pink 1959 Cadillac Convertible, “wings” ‘n’ all, parked outside! It turned out it was for a fashion photo shoot. Not to miss such a great opportunity to build on my on-going series of Miami South Beach Art Deco hotels with classic cars (even though this is Miami North Beach, not Miami South Beach), I got my iPad out and started painting, while trying to keep out of their way and out of the backgrounds to their shots! The scene I captured in my painting is that of a very special and unusual part of Miami Beach, a quiet off-the-beaten-track block that feels more like 1940 than 2018. It’s a gem that is going to vchange dramatically in the coming few years as this Miami Herald article explains. Now I am adding this painting of the Ocean Surf to the series, I’ll rename it the Miami Beach Art Deco series.